I hope you enjoyed My Day one of our Three days in Florence and I trust you are ready for day two. 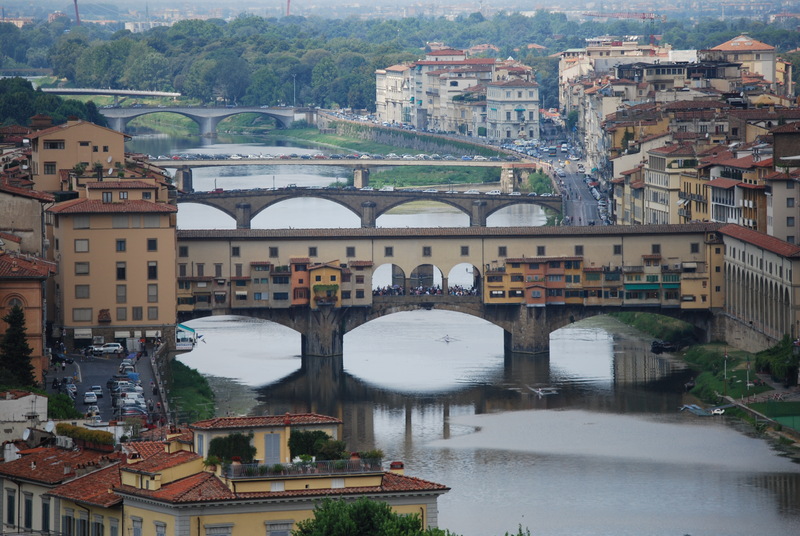 Last Spring when I was in Florence I stayed at the Pitti Palace Hotel; My room was not the best, the hotel, however, is located right on Ponte Vecchio and, best of all, it has a roof terrace where you can have breakfast while admiring the beautiful view. Nothing better to start your day! So let’s go! Today we start our tour from the Cappelle Medicee (Medici’s Chapels) in Piazza degli Aldobrandini (this is also the back entrance of the church of San Lorenzo). The Cappelle Medicee represent, since 1869, both a civic museum of Florence and the burial place of the Medici family. They occupy some areas of the Chiesa di San Lorenzo. The Medici were the Florentine family that dominated the political scene of the city for more than three centuries, beginning in the early 1400s. The museum is structured in two main areas: Sacrestia Nuova and Cappella dei Principi. The Sacrestia Nuova (New Sacristy), was the first architectural work of Michelangelo and includes the monuments for Giuliano and Lorenzo dei Medici. The impressive Cappella dei Principi (Princes Chapel), was designed to host the funerary monuments of the Medici family. The monuments are decorated with 4 allegorical statues: the Day, the Night, the Twilight and the Aurora. The space is entirely covered with marbles of different color and origin. Nothing simple in this room that at that time was considered one of the wonders of the world! After visiting the Chapels you can walk in the church. San Lorenzo was built on an early church that was consecrated in 393 AD. It was then rebuilt in Romanic style around the 1000s. 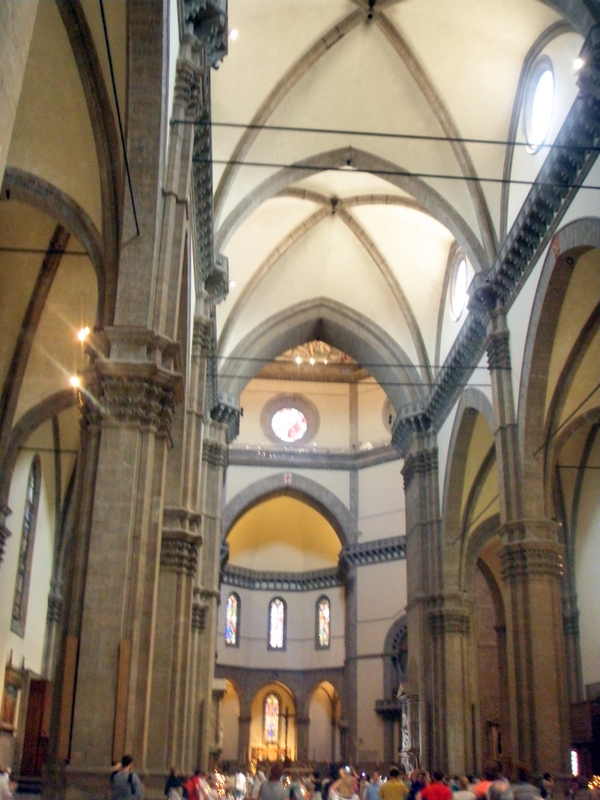 Giovanni di Bicci, Lorenzo de’ Medici’s grandfather, decided to transform the little medieval church into a family temple, and hired Brunelleschi for the work. 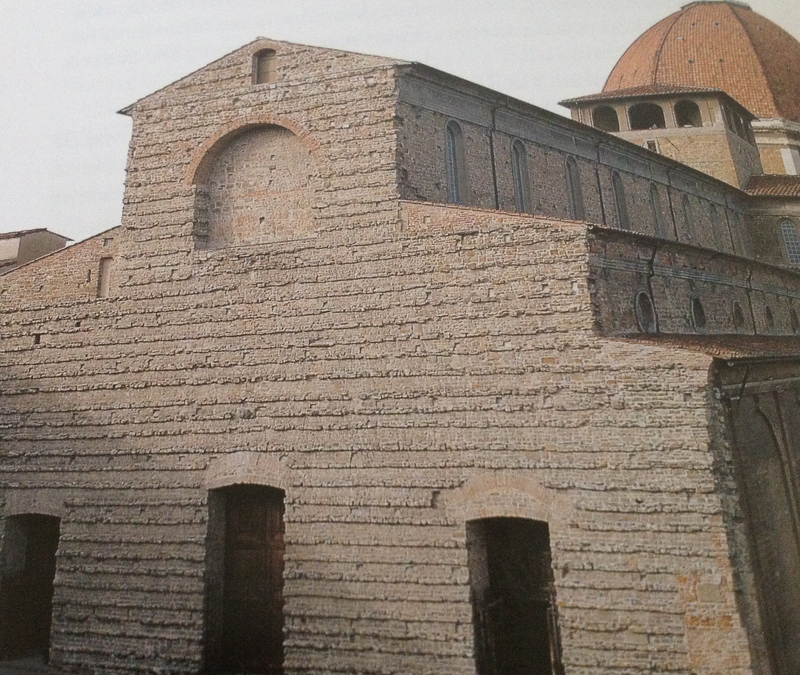 Brunelleschi, however, did not finish the work and left the façade unfinished. 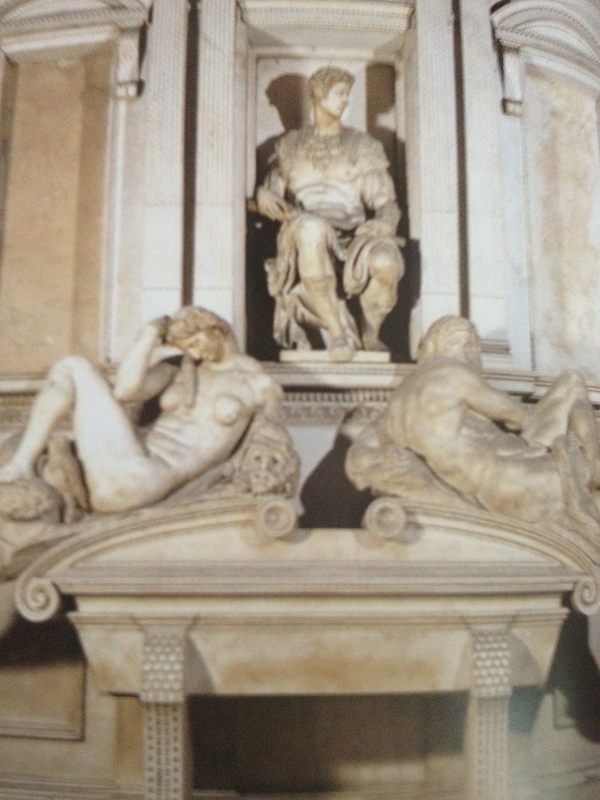 Michelangelo designed the interior façade, the sacristy and the library. By Donatello are the sculptures in the Sacrestia Vecchia (Old Sacristy). I personally love the Sacrestia Vecchia with its simple geometry, its clean lines, and its white walls bordered with grey pietra serena. The height of the dome makes it for a transcendent space. 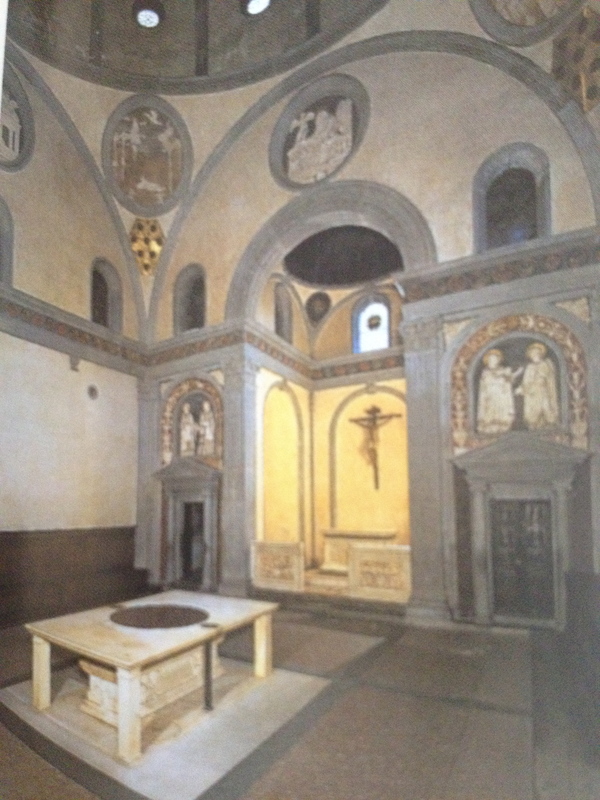 The sacristy houses the tombs of Cosimo il Vecchio, his parents and his children. From the left nave of the church you can access the Libreria Laurenziana (Laurentian Library), founded by Cosimo il Vecchio (de’ Medici) and enlarged by Lorenzo il Magnifico. From Piazza San Lorenzo take a right on Borgo San Lorenzo and arrive in Piazza del Duomo. Take in this overwhelming space. So much to look at: Il Battistero di San Giovanni (St. John’s Baptistery), il Campanile di Giotto (Giotto’s Bell Tower), and of course, the immense Santa Maria del Fiore (Cathedral). I could probably write one full post for each one of this landmark, plus one just for the Dome, but for the purpose of this tour (remember we only have three days) I am moving along based on my preferences. 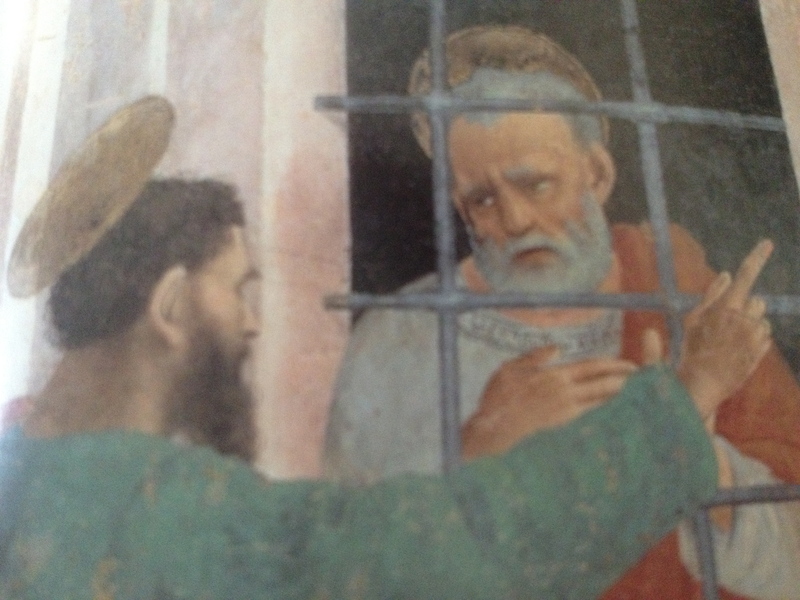 So, feel free to visit the Baptistery or to climb the Bell Tower – I have done it once . . . I though I was going to die. I did, however, take some beautiful pictures! 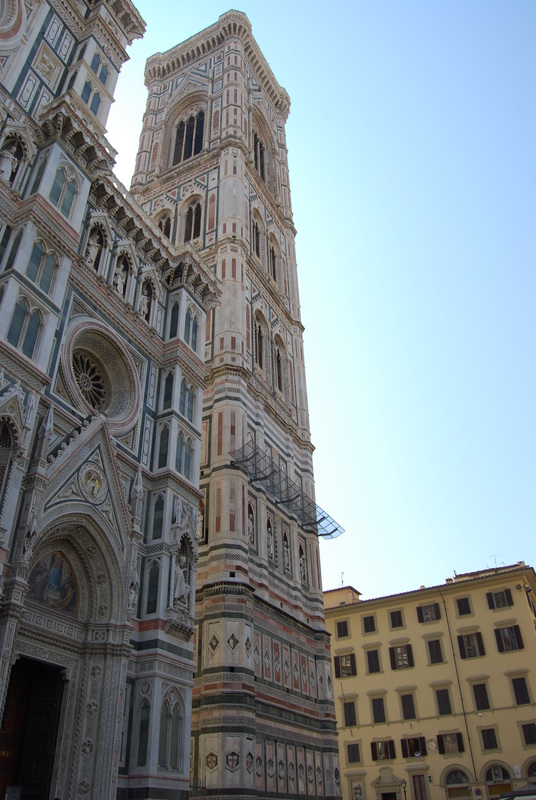 So today, I am heading right to the Porta della Mandorla del Duomo (North side) to access the Cupola (Dome). 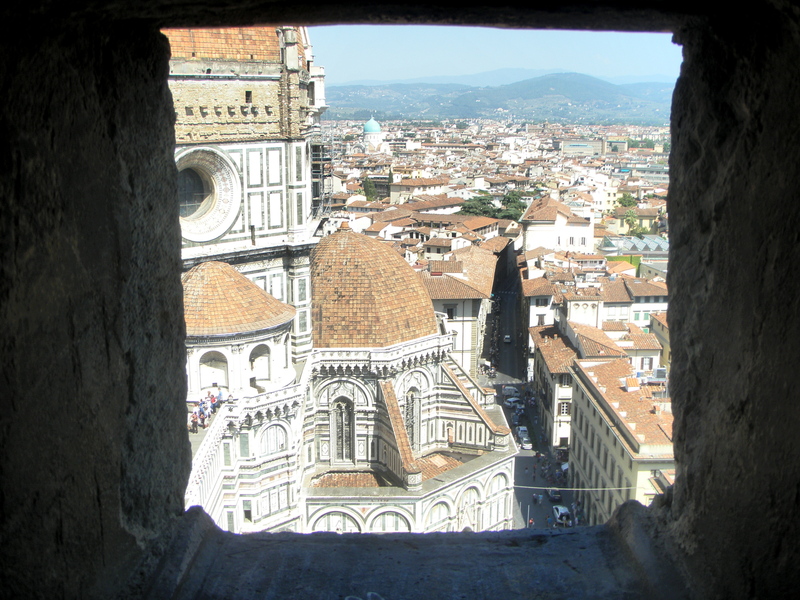 The Cupola of Santa Maria del Fiore is the biggest masonry dome in the world. 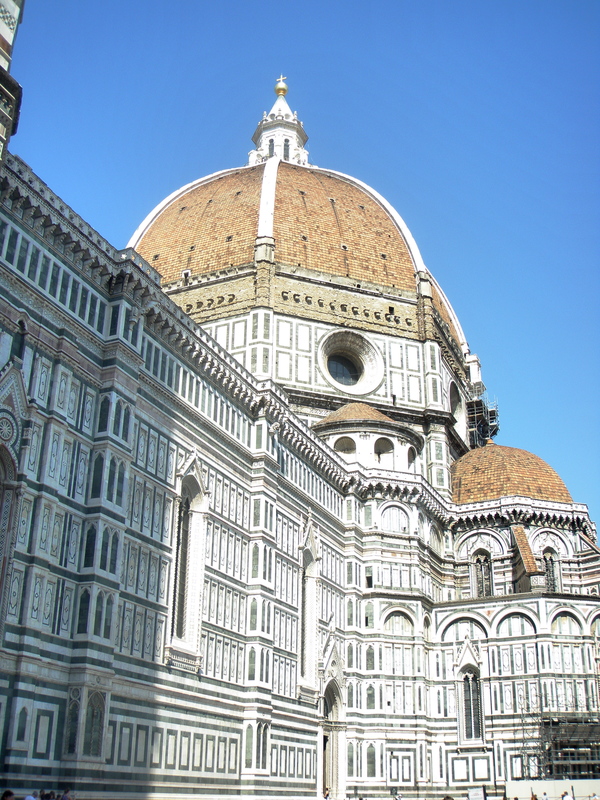 The dome was designed by Brunelleschi whose tomb is in the Cathedral ‘s crypt. 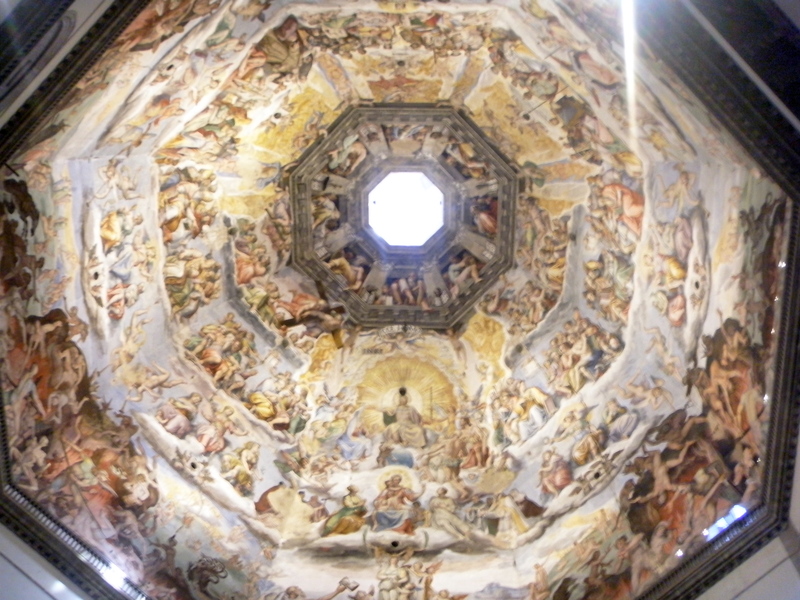 There are 463 steps to the base of the lantern of the dome but you will have a beautiful view of Florence and, more importantly you will be able to see the majestic frescos of the Il Giudizio Universale (The Last Judgment) by Vasari and Zuccari. With its 3600 square meter this is the largest surface ever frescoed. 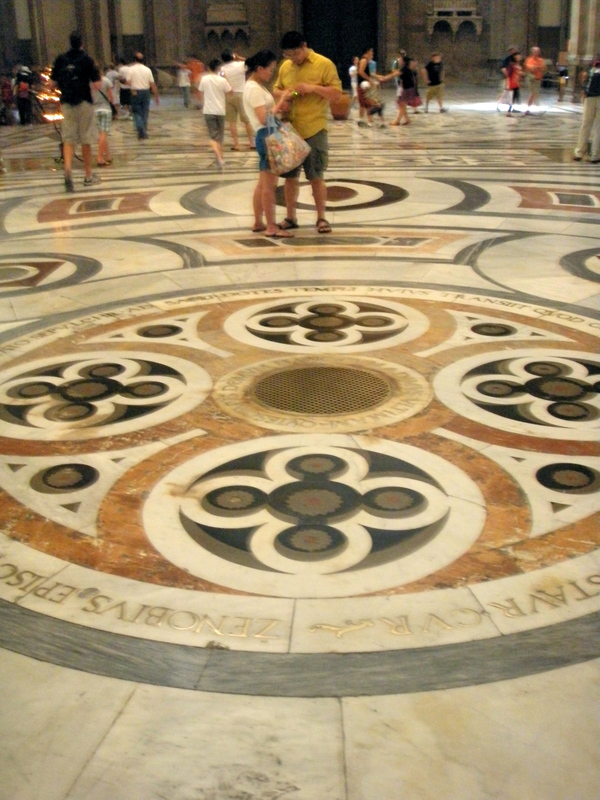 You will also be able to look, from above, at the geometry of the marble floor below. After the Cupola you can visit the Cathedral. 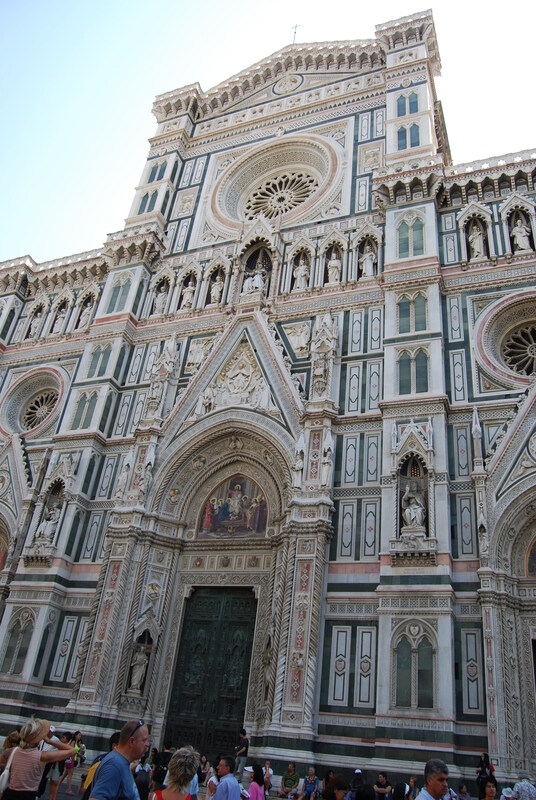 The Cattedrale di Santa Maria del Fiore (Duomo) with its 153 meter in length is the 5th biggest church in Europe. It was built on the site of the ancient Church of Santa Reparata of the IV-V century. Compared to the exterior, the interior appears as a vast space in faded color. There is, however, quite a lot of art in here. 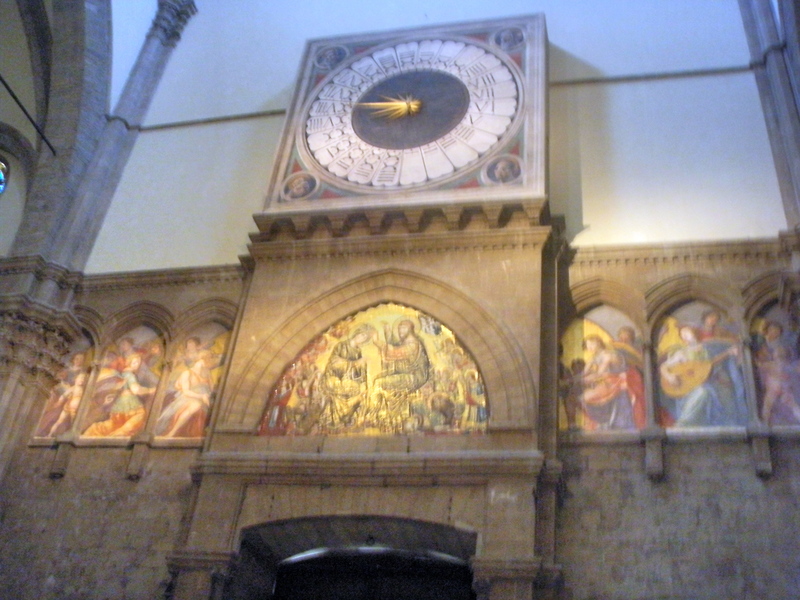 Take a look at the Orologio (clock), by Paolo Uccello, that is at the left side of the entrance. It looks like a daisy with twenty-four petals, one for each hour of the day. It only has one hand and it moves anticlockwise! This is the only clock in the world (still working) that marks the hora italica. This means that the day starts just after dusk, with the first hour of night. The next day starts the following evening. The hand moves anticlockwise because it follows the movement of the shadow casted by the sun, from East to West. Before you leave the Duomo walk downstairs for a short but well worth visit to the Crypt. The ruins underground are the remains of Santa Reparata, Florence’s oldest church and first cathedral. Brunelleschi’s tombstone is also housed in this space. If you are ready for a coffee-break, head to the Biblioteca delle Oblate. From the terrace will have one of the best (and free) view of the Dome. As a bonus, the children’s reading room has an wonderful original fresco of the Annunciation. The Biblioteca, is along Via dell’ Oriuolo, 5 minutes from Piazza del Duomo (behind the Duomo on the right). After your break, head to the Museo dell’Opera del Duomo. It displays all the statues, paintings, and tapestries that have been removed from the cathedral. 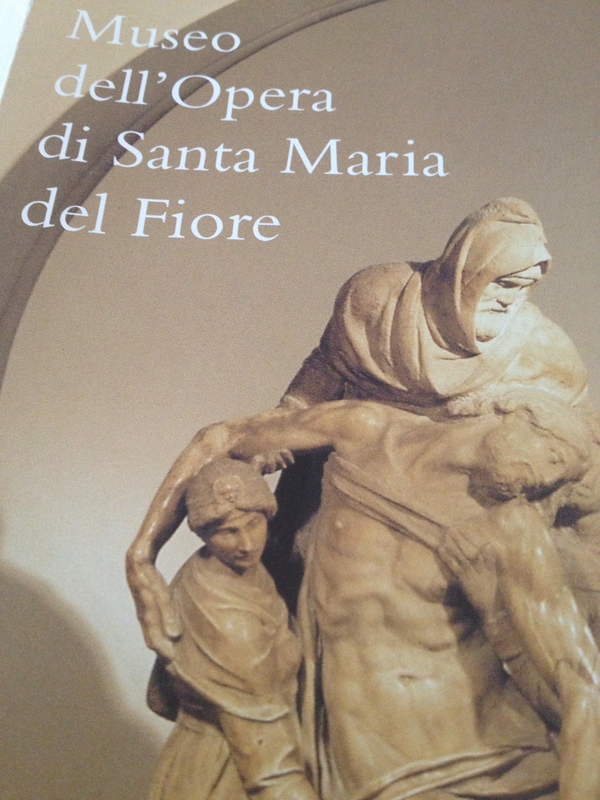 I find especially touching Donatello’s carving of Mary Magdalene. The entire sculptural decoration of Giotto’s Bell Tower are also housed in the museum. The museum also houses wooden models of Brunelleschi’s dome and lantern, and many models and plans of the different design for the Cathedral façade developed over the centuries. This past April 1st, after six years of restoration, the Silver Altar of St. John’s Baptistery has been put back on display at the Museum. Under the glass roofed courtyard you will admire the original version of the Porta del Paradiso (Door of the Paradise), designed by Ghilberti for the Baptistery. Is it time for lunch yet? 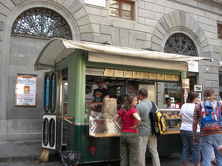 Head to Piazza de’ Cimatori and to the food cart at the corner. This is not a tourist attraction. This is where the Florentines stand in line to grab Lampredotto. I was introduced to this delicacy few years ago by one of my Florentine friends. Was I thrilled when she told me what it was? No! But, I tried, I liked, and I think you should try it too. Lampredotto is a street food at its best, it belongs to the popular Tuscan food tradition and yet, it is today considered a connoisseur food. I guess you would like to know what Lapredotto is. The main ingredient is the abomasus (also known as fourth stomach or the rennet stomach) of the veal. The stomach is cooked in a vegetable broth with onion, celery, tomatoes, and parsley. The low heat, slow cooking process ensures tender meat. The lampredotto is then cut into thin strips and served as sandwich with Tuscan bread. To further look like a local, when the person preparing the sandwich asks you if you want it ‘bagnato’ (wet) you should answer SI! The top portion of the sandwich will be dunk in the sauce where the lampredotto was cooked and it will be served dripping with sauce. After lunch, spend some time at Palazzo Davanzati. Often overlooked, this old building is the museum of the Ancient Florentine Home. This is where you can see how rich families lived in the 1300s and 1400s. Time to cross Ponte Vecchio and head to Oltrarno. 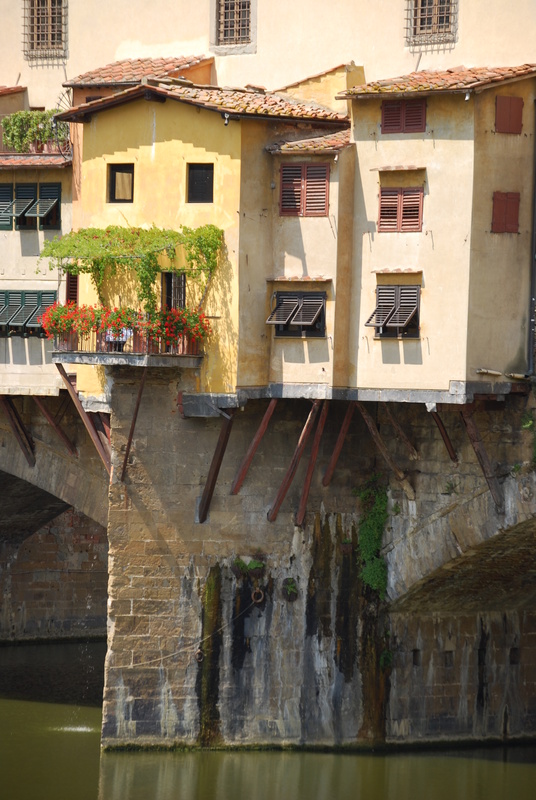 Ponte Vecchio is the only bridge that was not destroyed by the Germans during World War II. It also miraculously withstood the 1966 flood. Ponte Vecchio is lined with goldsmiths and jewelers (just look but do not buy!). 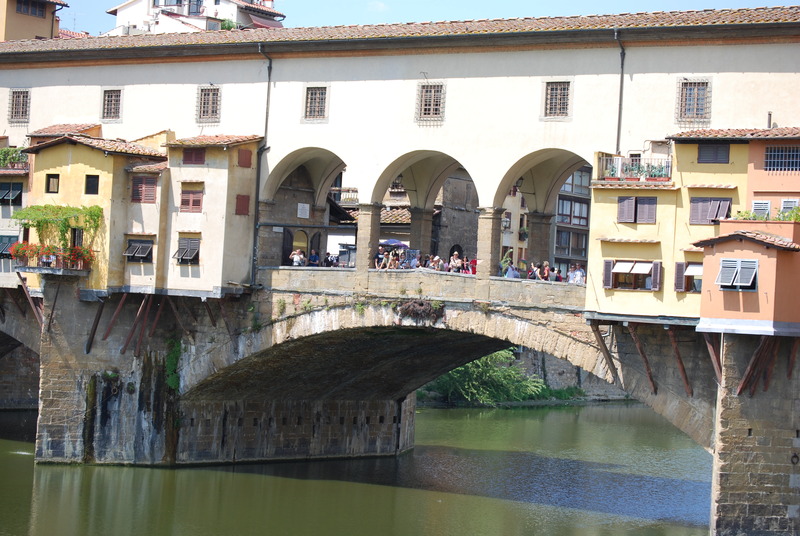 Across the Bridge, follow Via de` Gucciardini to Piazza de’ Pitti. Palazzo Pitti will be in front of you. This has been the residence of famous people, the Medici, the Lorena and the King of Italy (Florence was Italy’s Capital from 1861 to 1875). You can visit Palazzo Pitti if you feel inclined to do so but, I rather take a stroll in this area of Florence known as Oltrarno (beyond the Arno). In this area many art & crafts, and antiques shops can be found. You can visit workshops where wood-carvers, goldsmiths, marble and ceramics restorers, and cabinet-makers live and work. There are also lovely small trattoria, café, gelateria and pizzeria. Walk to Piazza Santo Spirito and enjoy this beautiful square and Brunelleschi’s homonymous church. Piazza Santo Spirito is the only square in Oltrarno where a food and clothes market is held each day. 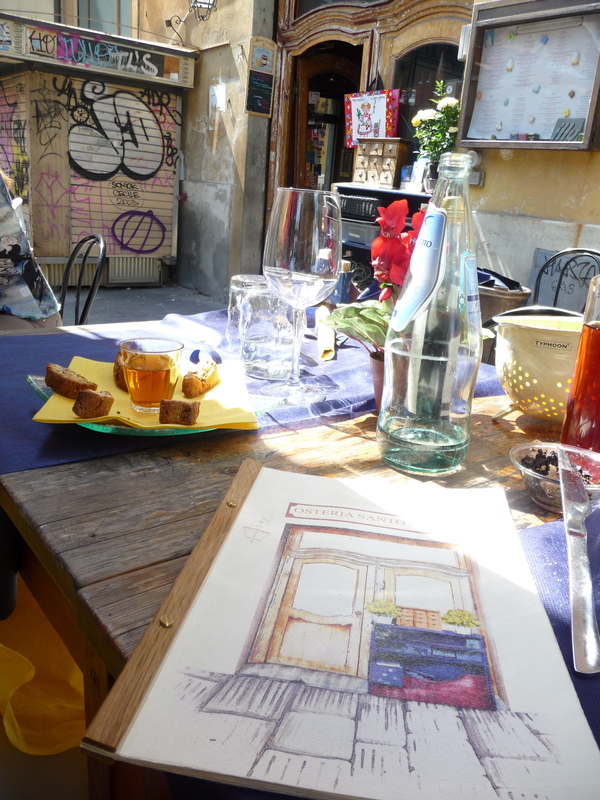 Here, I had a lovely lunch at Osteria Santo Spirito. 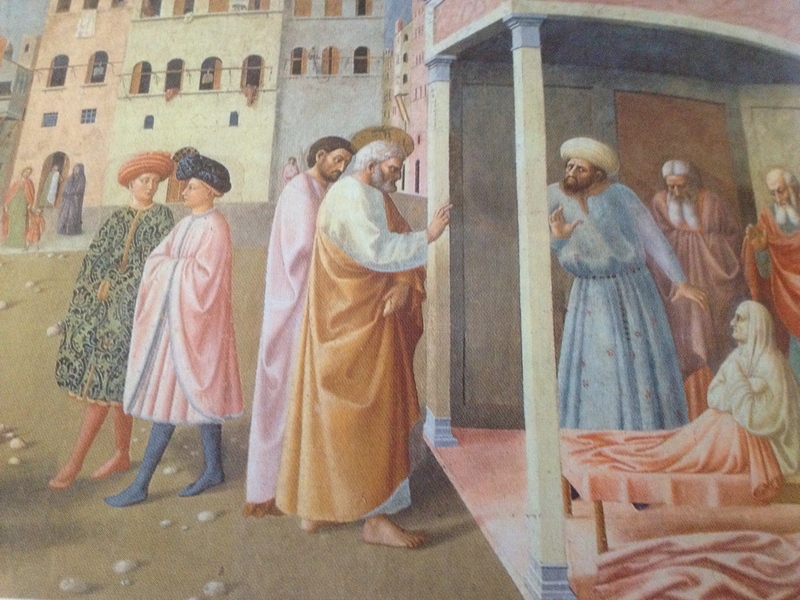 From Piazza Santo Spirito walk to the church of Santa Maria del Carmine to visit the Cappella Brancacci and be mesmerized by Masolino and Masaccio’s frescos. From The church head back toward Ponte Santa Trinita. Cross the bridge and follow Via de’ Tornabuoni. This is the fashion street of Firenze. The first palace on Via Tornabuoni (on the right) is the Ferragamo shoes boutique and Museum. I am a shoe’s lover so, definitely a stop here for me! My next must stop place is Arte del Cioccolato on Via Porta Rossa (corner of Via Tornabuoni). This is Roberto Catinari’s chocolate shop. This is chocolate lovers’ heaven. You can sit and indulge in a selection of chocolates paired with wine, you can sip specialty caffe` (always enhanced by chocolate) with literary names such as Virgilio, Beatrice . 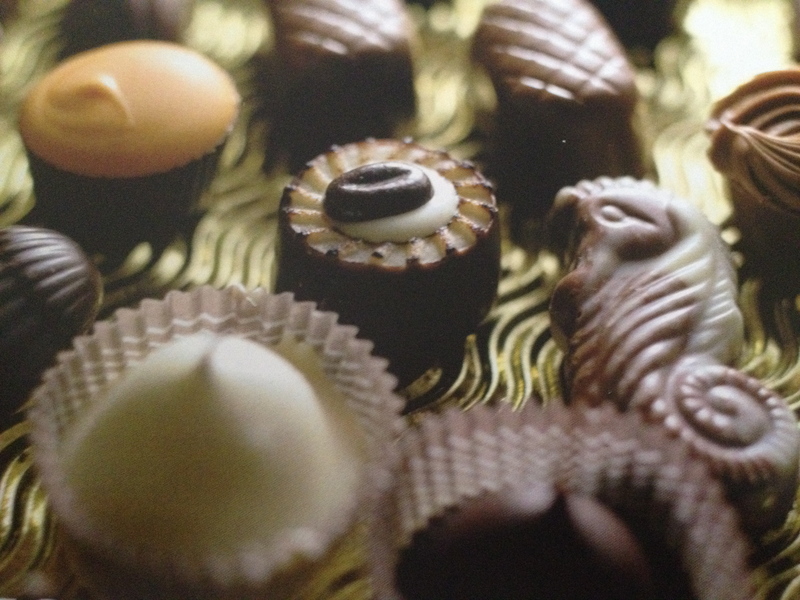 . . or you can simply take home a box of wonderful cioccolatini. 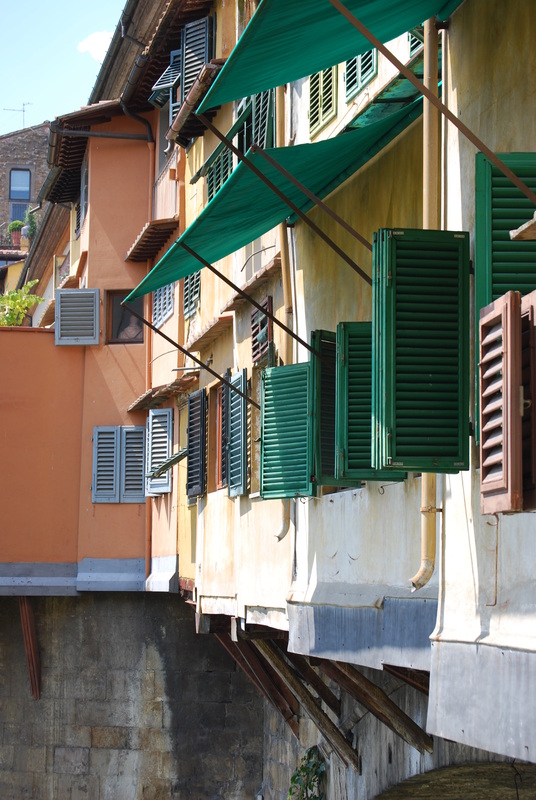 Along Via de’ Tornabuoni you will walk in front of Palazzo Strozzi (on your right). 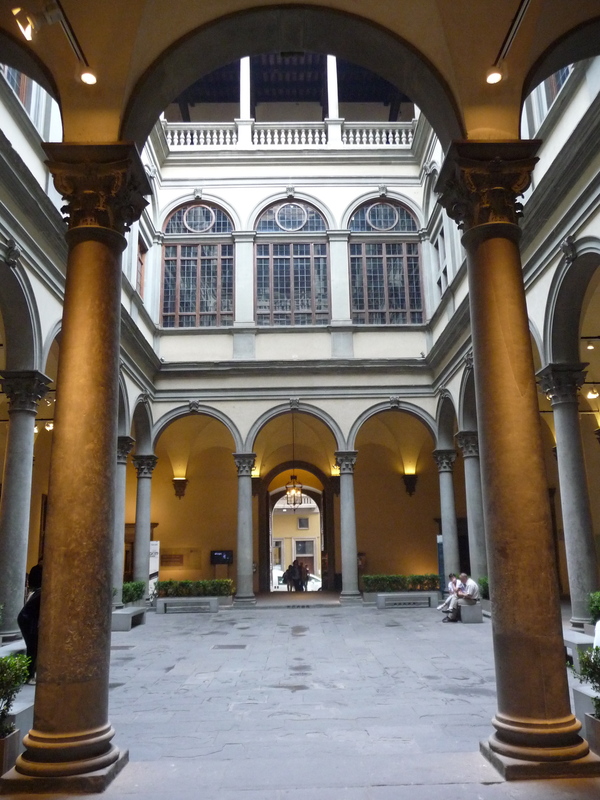 Palazzo Strozzi represents a perfect example of the ideal mansion of the Renaissance and the whole looks like a small fortress in the hearth of the city. 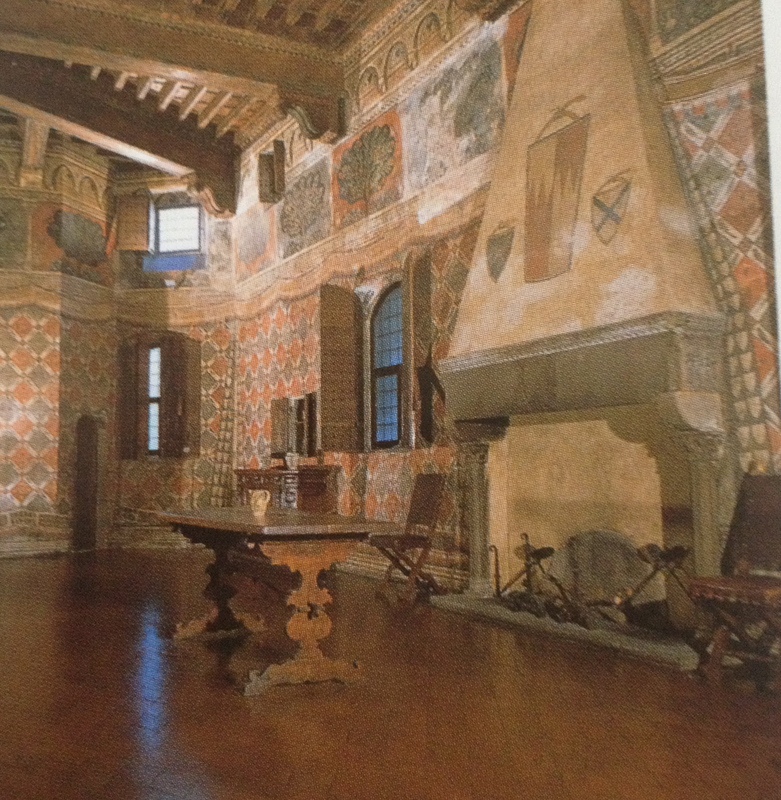 The palace is today considered the main space in Florence to host temporary exhibits. The current exhibit is: American in Florence – Sargent and the American Impressionists ( March 3- July 15). It has been a long day and you should reward yourself with a juicy Bistecca di Chianina DOP (Steak from Chainina beef ‘Protected designation origin’ certified). Right here, at the corner of Via Tornabuoni, in Via del Trebbio, there is one of my favorite restaurants and one of the best Bistecca in town, Buca Lapi. Take a night stroll at your leisure, stop at Cafe Gilli in Piazza della Repubblica for people watching, and have a good night sleep before your last day in Florence. Have you been to Florence? What did you enjoy the most? Leave a comment to share your experience! Thank you! Come back for day three for more of my faves! Wish I had all this information when we went to Florence. But we were on a group tour. We did get to see so much and loved Florence, my favorite city in Italy. Vicky, Thank you for sharing and well, you know where to find me if you ever need a customized tour anywhere in Italy!